Four years ago, Emmett Linklater could have chosen anything for his final project at the Community School. He decided to do something big. Well, "big" in a tiny sort of way. 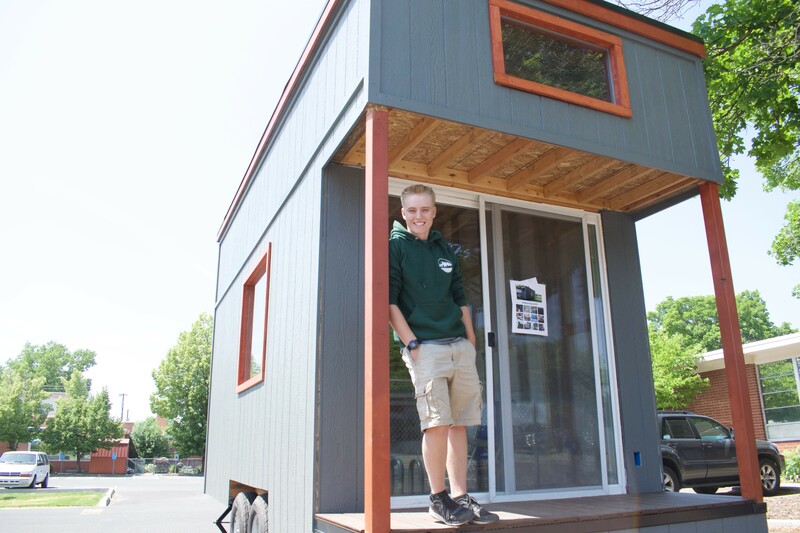 Linklater will graduate this month with a tiny home he built for his required independent school project. But Linklater didn't just do it for school credit. He plans on living in it for college at Western Washington University. "I just like the idea of having a house that I can move to where I want to go," Linklater says. During Linklater's first two years at the Community School, a project-based high school, he mostly planned out what he wanted the tiny house to look like. It's about 210 square feet — an average size for a tiny home. The interior isn't finished yet, but eventually it will have a bathroom, kitchen and bedroom. Linklater knew a little bit about woodworking. He had to learn how to weld for the trailer the home sits on, he says. The last couple months, he built the frame and did the exterior work with the help of some family friends. He designed it knowing that one day he would eventually live in it. "I like living simply and living smaller," Linklater says. Theoretically, it will save Linklater money. Linklater says his parents helped him with the costs of building the home. They did so knowing that, in college, Linklater would live in the tiny house instead of a dormitory. "I'm lucky enough to have parents who funded it, they kind of think of it as saving money," Linklater says. "They can pay a couple thousand dollars to build a tiny house, or pay tens of thousands of dollars to room me at college for a couple years." Linklater plans on majoring in environmental science at Western Washington University. He won't live in the tiny house immediately, because he wants some time to figure out where he's going to put it. Linklater admits that the project took more work than it needed to for the school's requirements of the independent project. The school lets the students choose almost anything they want to for the project. They can build something, learn a skill, write a story, or do anything else they're interested in. The students just need to have a plan and follow through with it by the time they graduate. "The idea," Linklater says, "is you get something out of it more than a grade." And now, the high school senior has a home. McMorris Rodgers and Brown agree that Trump's tariffs are awful for WA — so would they pass bills to stop them?